Prior to receiving the Holy Spirit, I questioned many of the scriptural references that I will be referring to in later pieces, but I was sincere in that I wanted to be right with the Lord. I wanted to know I was saved. It is not up to another man or woman to tell us whether we are saved. God has always defined the pattern for his people. In the Old Testament, the Lord always gave a glimpse to people but then required from those people to be humble enough to test him out by following his instruction. He didn’t force them, he invited them. Such is the nature of God. Receiving the Holy Spirit is the same. God’s nature has not changed. It’s just that we happen to be fortunate to live in the gospel (“good news”) age. The day I received the Holy Spirit about 30 years ago, I was pleasantly surprised that it was all true and that the experience they had in the book of Acts happened to me, in the same way, that it is has happened to countless others. It is by far the best thing that has ever happened in my life. The miracles of healing and blessing – as well as the joy that I have experienced in my own life – and observed first hand in that of others, are practical and real. The Lord provides us with proof. The only question is whether we are prepared to humble ourselves to His Word. “The fear of the Lord is the beginning of wisdom”: Ps 111:10. I wanted to create a blog segment discussing my experience in receiving the Holy Spirit. It has had such an impact on my life. I would like to have the chance to share this experience and God’s message with more people. 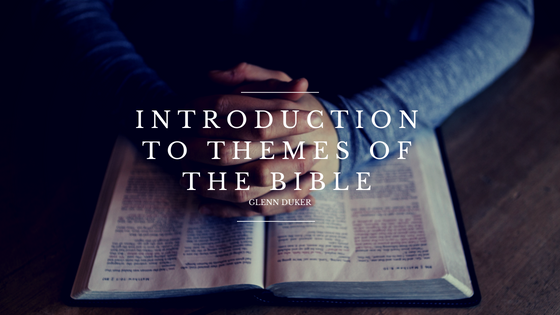 These segments will be focusing on certain Bible themes and the scriptures that are in relation to those themes. The themes I will be focusing on are Doing what God says, Why Speaking in Tongues, Spiritual Gifts, and Getting right with the Lord. Keep an eye out for these themes in my upcoming articles! Communion is defined in the dictionary as the “sharing or exchanging of intimate thoughts and feelings, especially when the exchange is on a mental or spiritual level.” It is also defined as “the service of Christian worship at which bread and wine are consecrated and shared.” The Church practices what is called communion. Jesus had his last communion with his disciples before he was crucified is known as the Last Supper. 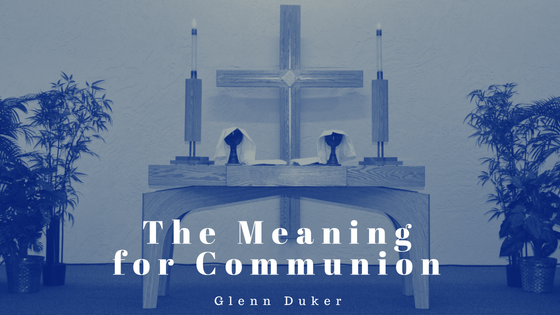 Communion uses bread to symbolize Jesus’ body and wine to symbolize His blood. But why do Christians eat a small piece of bread and drink wine during their church services? The tradition of communion was started by Jesus. When He died for our sins on the cross, He told His followers to remember His sacrifice by using bread and wine. He said to his disciples, “Unless you eat the flesh of the Son of Man and drink his blood, there is no life in you” (John 6:53). The bread of life means He has nourished us and we can be saved because of Him. In the early days, the Church celebrated Jesus by taking communion every day. Every time they gathered to eat and drink, it was a chance to thank God for all He has done. Communion is not a ritual to be performed mindlessly. It is not a way to guarantee yourself a spot in heaven. You must be aware of the reasons why you are doing it. It is to remember what Jesus has done for us and why He did it. It is not just about the bread and the wine, but the spiritual essence behind it. It does not only have to be performed at Church: the Lord is not bound by a building. Next time you celebrates communion, remember why you are celebrating. It is a righteous thing in the eyes of the Lord when a spirit-filled person takes communion. Take a moment to give thanks to Him and use it as an opportunity to connect with Jesus. It can be a way to remember the Lord and focus on the fact that he has filled you with his wonderful Holy Spirit. Going on a mission trip can be an experience you will never forget. You are going to less fortunate areas to provide help and the love of God. Along with the opportunities to spread the word of God, mission trips can include humanitarian projects also. Countries hit by natural disasters or lack financial aid could have construction projects that consist of renovations, rebuilding, or starting from the ground up. The mission trip typically helps to build new schools, churches, orphanages, and homes in less fortunate areas. If you are able-bodied, you do not need extensive previous knowledge or experience with building or construction. You could be teaching in a school, church, or orphanage. There could possibly be a language barrier and you would need to pick up on language norms of the area you are residing. You could be teaching students, teachers, or townspeople. Teaching can help children grow academically, socially, and spiritually. Typically qualified or experience school teachers are meant for this role but if you have a passion for it, there should be no stopping you. You can also provide child care in certain locations. Child care does not require a qualification to spend time with people in need. If you are a doctor, nurse, or student in related fields of study, then you might want to consider a medical mission trip. This helps with practical experience, practice medical skills, and most importantly make a difference in someone’s life. You can bring medical relief to communities in need and lack the basic services in healthcare. Whether you are performing basic check-ups or shots, every moment helps. If you love wildlife, nature, and ecotourism. a conservation mission trip may be the one for you. Helping the locals preserve beaches, rainforests, or mountains could be your next calling. Traveling abroad to exotic locations to help protect and help rehabilitate endangered species worldwide. You will be protecting natural habitats of wildlife and sometimes specific animal conservation projects. The main difference between these trips just being thought of as humanitarian work, is that during them the members are spreading the word of God. The projects are a great thing to do but the participants will focus on promoting the Gospel of Jesus during mission trips. 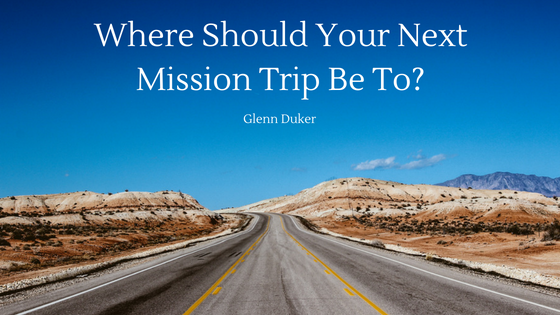 Where Should Your Next Mission Trip Be To? A mission trip gives Christians a chance to make a difference in the communities around them and beyond. Going to countries that are in need, to help and share God’s love is the main goal of a mission trip. There are many places around the world that need the help of mission work, whether it be in Latin America or in your own backyard. Central America has many countries that could use the help of missionaries. The wet season here causes floods and hurricanes that destroy many homes. This creates a need for building and restoration projects. Also, missionaries often visit the many orphanages to spend time sharing the gospel with the kids. Haiti is a small, tropical country with rising poverty rates and a large number of orphaned children. Haiti has had its fair share of natural disasters. It has suffered cyclones, hurricanes, tropical storms, torrential rains, floods, and earthquakes. All these disasters either end in uninhabitable cities, injuries, or even deaths of many people. There is a strong need for food, water, healthcare, education, and building projects. There are many companies providing help. One company, Healing Haiti, sends people on mission trips to improve the lives of the people living in these disaster-stricken areas. There are some countries that don’t consider Christianity a primary religion. No matter what religion the country is known for, there is still a need for mission work. The mission trip could simply be to have bible studies with orphans and spread the love of God. There are areas in Africa, India, and China that could benefit from a mission trip. The purpose of a mission trip is to create a life-changing experience for the community, no matter what the community believes in. A helping-hand doesn’t have to go across the world to make a change. There are plenty of projects that can be done around you and are just as rewarding as going around the globe. Participate in a project by building or repairing a house for someone who can’t afford it or who physically cannot do it themselves. This can still spread God’s love even if it doesn’t seem like it’s going very far. In the end, every bit helps. 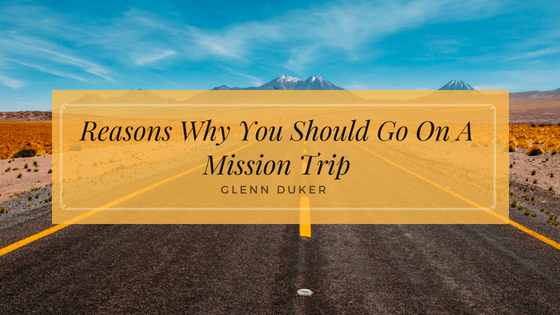 If you want to read more about why you should take a mission trip, check out Glenn Duker’s Blog, Reasons Why You Should Go On A Mission Trip. A group on either a short-term or long-term mission trip can experience many different things. Whether it’s building a house, playing games, or traveling, everything is done together. It builds a community within this mission group and bonds them not only to each other but to the community in which they are helping. Reading a newspaper every day can keep you updated on what is going on in the world, but a mission trip helps you experience what is really happening. Reading that kids in Central America don’t have anywhere to live doesn’t quite hit you until you visit the poverty-stricken town. You can begin to understand that it isn’t just a newspaper article or a commercial asking to give 50 cents a month. It is a town like your own, struggling in this world, needing help that you can provide. Mission trips will demand a lot from you, from getting up the courage to leave your home for weeks at a time to build a house for homeless orphans. The extent of the trip can be challenging. You will be experiencing new cultures, new skills, and new people every day of your trip. Your mission trip will certainly push you out of your comfort zone in several ways. It can also bring a new demand to your faith that is practiced outside the walls of your church. Your spirituality can be brought forth by your actions in the real world and not just be confined to sermons every Sunday. Being able to share God’s faith is an empowering event. You can find many possibilities for the future and develop a passion for the work you have done. Not only can you find these things, but mission trips give you the ability to pursue them. Mission trips show the capabilities of people and the good they can provide in the world by delivering it with the help and the faith it needs. 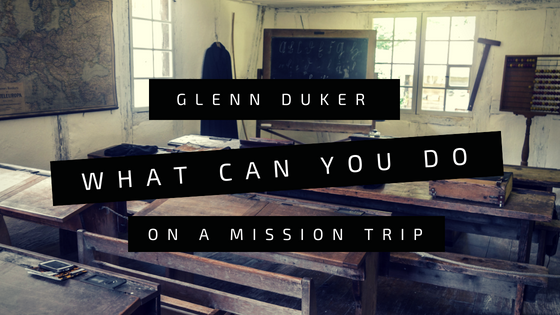 To learn more about places where you can go on mission trips, read Glenn Duker’s blog, Where Should Your Next Mission Trip Be To. © 2016 Glenn Duker. All rights reserved.